I'm sort of a newbie to the coffee world. Of course I've had no trouble coming to love the rich flavors that can be created from it and the caffeine buzz doesn't hurt too much either. I like the soothing feeling that a hot cup of joe brings as it warms my lips all the way down to my toes. How have I ignored coffee for so long! Well I am going to make up for lost time that's for sure. I've got my new coffee machine and grinder all set to go. My mug collection is slowly growing, Walmart has a great selection. My freezer holds several types of coffee beans and grinds. Upon opening my fridge I am greeted with the colorful bottles of different Nestle Coffee-mate creamers. I bought almost every single flavor they make including hazelnut, peppermint mocha and french vanilla. Thanks to a nice coupon available to print online I was able to save some money. The creamer is easy to find at Walmart. The possibilities are endless in my kitchen! The other day I stopped at a coffeehouse just to kinda see what they had and the prices stopped me dead in my tracks. I was doing the math in my head. For the price of 2-3 drinks there I could make like 30 drinks at home. Of course that was just a crazy rough estimate but you get the point. My New Years resolution was to save money and not eat out too much, that includes drinks. 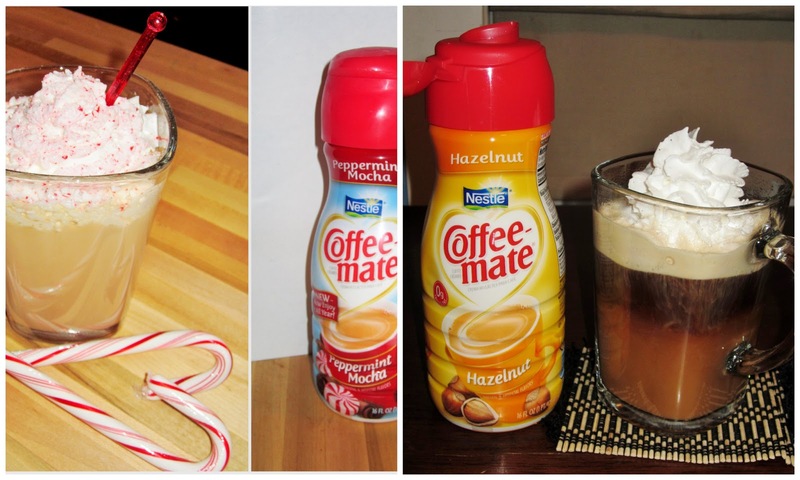 I had to stick to that and making some tasty coffee house copycat drinks at home would save me piles of money for sure. So let us get started! 5. ENJOY, keep a swizzle stick handy to stir up your goodness! My next recipe is sort of coffeehouse inspired. The place that I had scoped out was serving a mint mocha type of drink and it came with bits of candy cane on top. I had actually had it one morning long ago because of a coupon I'd received for a couple dollars off. It was quite delicious and mint is one of my favorite flavors. I just had to try and create a dupe for at home, so I did! I call this my holiday mint mocha latte. You are going to love making this one. So first off I needed to make espresso for my latte and since I do not own an espresso machine I decided to make my coffee in a way that would be espresso-like. All you have to do is take your regular grind and toss it back into the grinder a couple of times to make it super fine. 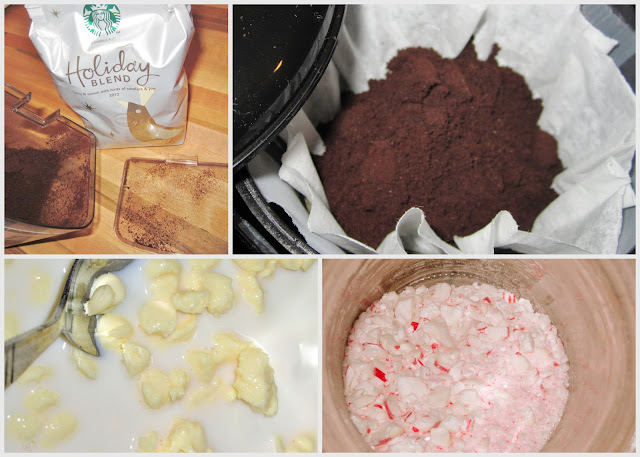 Then double up the filters and use 1/4 cup of water to every tablespoon coffee grounds. I add already super hot water to my machine just to make sure the water is very hot and then I turn it on. The best way to do this is in 1 cup batches. If you do more you could have an overflow situation. This will drain much slower than a normal pot, that is what we want! Be sure to pack the grounds down into the filters with a spoon before you turn the machine on. 1. While coffee is slowly brewing melt the chips with the milk in a small sauce pan. If you skip the chips you will still want to heat the milk. Stir constantly then take off of heat once melted. Stir in 1 Tbsp of the crushed candy canes until they melt. 7. Enjoy! You should have enough ingredients left to make two drinks. Be sure to adjust the creamer and coffee mix according to how you like it. 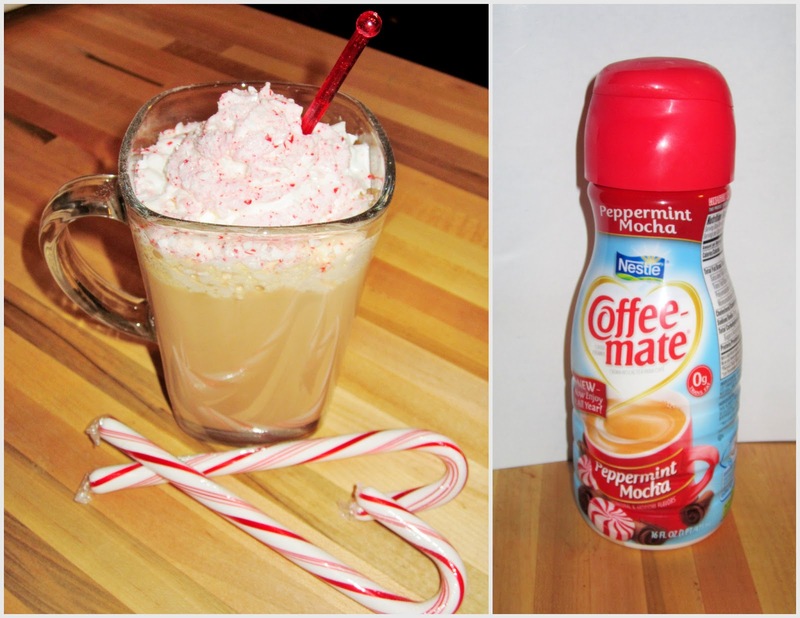 I personally like it sweeter and so I added a bit more of the creamer. Be sure to visit Nestle Coffee-mate on Facebook and Twitter! See my whole shopping trip HERE.